“Yes, my name is IgglePiggle,” is something I have heard every single day over the last three odd years. If you are a parent to a 0-4 year old, you will know what I am talking about. If you have ever been around a 0-4 year old, you too will know what I am talking about. For all the rest, what planet do you inhabit? Bedtime in most households is synonymous with In The Night Garden playing on the CBeebies TV channel. It is when IgglePiggle, Upsy Daisy and Co. make their daily sojourn through the garden at night. 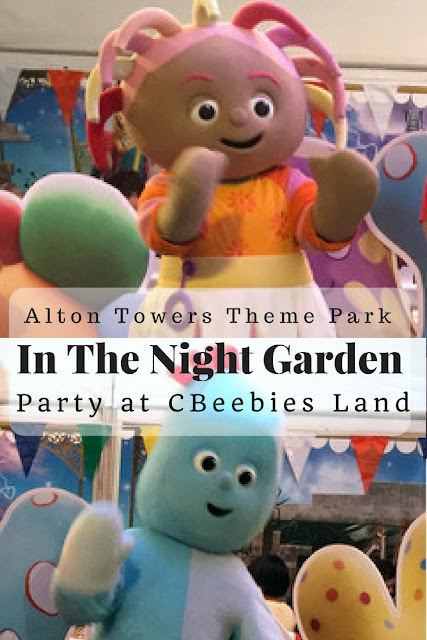 It is a year since CBeebies Land at Alton Towers opened the In The Night Garden Magical Boat Ride. They hosted a lovely birthday party to mark the occasion, and J was invited to attend with his family. Imagine the excitement in the C-house when a personalised invitation from IgglePiggle came through the letterbox! The one year anniversary celebrations started with IgglePiggle unfurling the world’s largest polar fleece blanket in order to set a new Guinness World Record. Made by Dreamtex Ltd, who manufacture the In the Night Garden Home Textile Collection, the record-breaking blanket measured in at 98.8m.sq. A Guinness World Records Adjudicator verified the new Guinness World Records title, presenting IgglePiggle with an official certificate to mark the achievement. The party that followed was well attended by excited children and their families. IgglePiggle and Upsy Daisy were on hand to pose for photographs with the little ones. There was a fantastic team of entertainers to keep the star-struck crowd entertained. There was singing, dancing, music and a book reading session that was very popular. 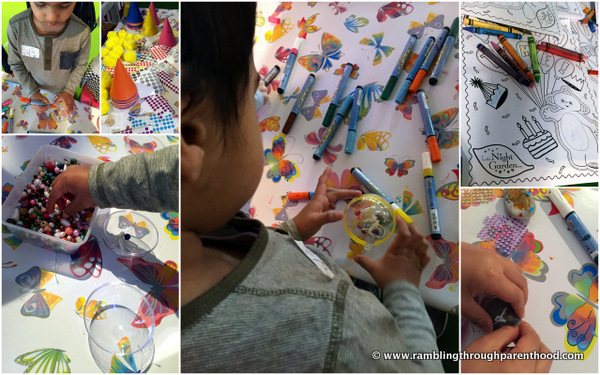 If the dance floor proved too overwhelming, little ones had the option to participate in a variety of art and craft activities. They could decorate their own party hat or watch a balloon animal take shape. J chose to colour in Maka Paka and his pebbles. He also got to make a bouncy ball, complete with decorations of his choice. No birthday party would be complete without food and drink. There was a delicious buffet spread with hot and cold drinks to keep everyone well satiated throughout the proceedings. And birthday cake, of course. Cake consumed, goody bags handed out, it was time to say thank you and goodbye to IgglePiggle and Upsy Daisy. But the day was far from over. After the party, we ventured out into CBeebies Land to experience the In The Night Garden Magical Boat Ride. J loved it, and I loved it too. It was so relaxing and soothing, no wonder they call it magic. Take a look and judge for yourself. Disclaimer: We were guests of CBeebies Land and Alton Towers Resorts for the purpose of this review. All opinions are my own. What a lovely day! We haven't been to CBeebies Land and my two are getting a little old for it now...may have to book a trip before Little O turns 4. This seems like lots of fun! Jack would have loved this! Very exciting day out! My son used to love Iggle Piggle. What a wonderful day out.....It looks like there was so much to do and see. Fantastic fun! A few years ago my girls would have loved this. They were huge fans of the Night Garden. 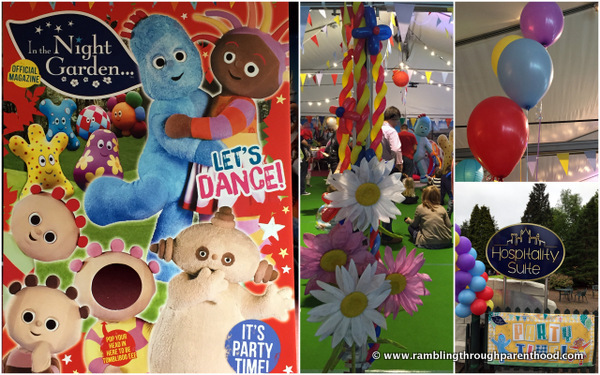 Cute party, we love In the Night Garden and haven't been to CBeebies land as yet. This looks like a lovely party. We used to love In the Night Garden too - such sweet characters! what a great day Erin would have such fun. Looks alot of fun!! I think Alfie would have a great time. What a brilliant day out, we haven't been to Cbeebies land yet and I really want to visit. It all looks lovely but I have to say I'm not sad that mine are too old for the Night Garden now! It all sounds like a wonderful day. How amazing to be invited to a party by IgglePiggle himself. My children adore Cbeebies Land at Alton Towers; we're off there next month and they can't wait to try out the new Octonauts rollercoaster.